The adorable android Bido has finally arrived on Delta V! Well...technically. He's still hanging out in the Afterlife (accessible from Frysteland), but he's SUPER curious about all these humans running around and dueling each other. He knows the quickest way to a human's heart is food, but new weapons are also a big draw to the combative citizens of Delta V.
Visit Bido, floating casually on a piece of broken Void rock, and investigate his brilliant shop packed with amazing items! Bido knows what humans like, and he knows they love the thrill of battle! Help Bido enjoy that same thrill by bopping him on his shiny round head with your new Heavy Katanas! Bido is withholding a couple weapons for himself. Through enough battle, you may be able to "persuade" him to drop them for your use. Help Bido get in touch with his human side and learn about the world beyond the Void through a series of new missions with spectacular rewards! 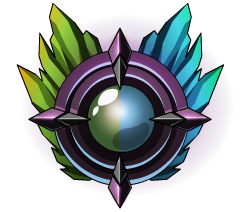 Plus, be sure to claim the Bido Breaker achievement for besting the runty robot in battle! Bido is also bringing a hearty bounty of new home items for your enjoyment! Stock up on katana displays, dragons, and bobbleheads to really help tie that Frysteland Yurt of yours together. 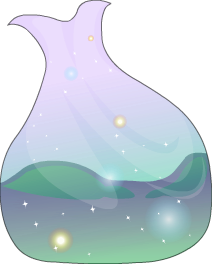 Void Essence, made from coalesced Void particles, can be collected from the level 35 Void Creature, the Void King, and Bido. 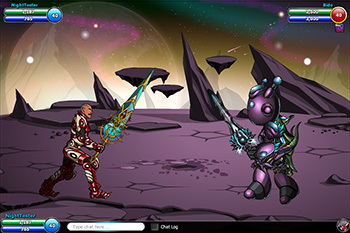 This will give those who missed the Gifting event a chance to collect one of the most awesome armors in game! If you're very close to unlocking the armor the old way, Void Shards will now be available as Silver Tier items form the Frozen Fury Arcade machine! 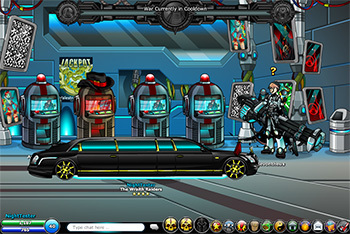 This Friday, Revontheus will be offering a new, full color custom version of the Limousine. It was a heady task to break this complex vehicle down to perform the color separations while maintaining the effects of the gradients (Rev loooooooves him some gradients). We would like to extend a special thanks to RomanianMaster for suggesting this. He will be receiving his own in-game as soon as the release goes live! I hope to see some trendy duelists cruising around Delta V in style! This week marks the return of a very special bot to Delta V: the infamous Pyro Fly! This Friday, visit Kraggor for a fresh restock at 10 AM EST and 4 PM EST and own this bot for yourself! 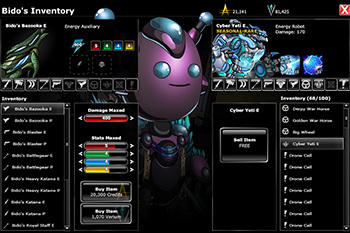 The bot's primary attack is a sweeping infernal beam that scorches enemies from a distance. The Pyro Fly's special skill is Infernal Swarm, an especially nasty and sneaky ability which causes tiny mechanical fireflies to swarm your opponent and neutralize one skill at random. Be sure to collect this bot before it returns to the depths of the Infernal Mines for another year! Mark your calendars because Bido's Artist Showcase Shop is next week! 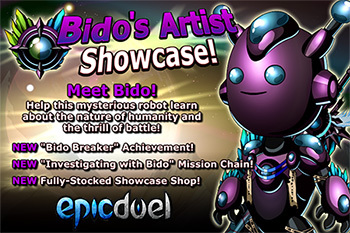 Enjoy weapons, missions, and achievements galore as you meet Bido in the Afterlife! Will he be an ally or does his disarming appearance hide more sinister intentions? 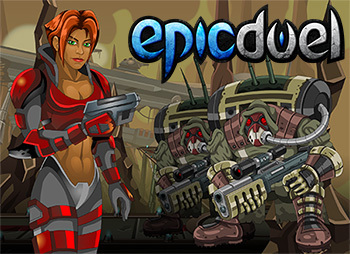 Find out next week in EpicDuel! Game development is the ultimate team effort! We all want to succeed together! 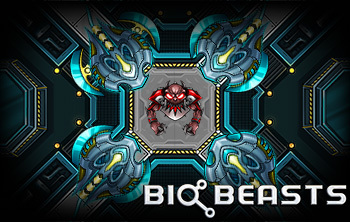 Learn more in the latest BioBeasts blog post! If you thought Flappy Bird was hard, you gotta try this app. It is hard, retro, hard, simple and super hard. Lasting 10 seconds pretty much means you are a gaming god. Tell you what. Get over 1,000 points and the entire internet will bow down before you claiming you are the ultimate gaming god of the universe. Hurl down a wormhole in an 8-bit spaceship… that has a proven track record of exploding… in this retro arcade runner (technically speaking, a space-time continuum flyer). Your only goal is to survive as long as possible. The longer you last, the faster you go, and the higher your score climbs. 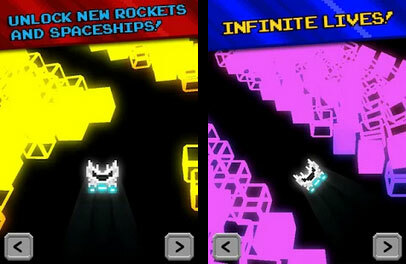 Survive breakneck turns as you dash through geometric wormholes that will shatter your spaceship — and hopes of a high score. Luckily for you, you have infinite lives (and, apparently, an amazing mechanic), so you can replay the game without hesitation or remorse for the rocket you just destroyed seven seconds earlier. This ridiculously hard twitch game was created as an overnight project by Rolith and the CRIT Team at Artix Entertainment. May you enjoy countless hours of frustratingly, addictively-beautiful space-travel with VelocityAE! If you think you can beat my high score, or Cysero's, or Rolith's - show us! 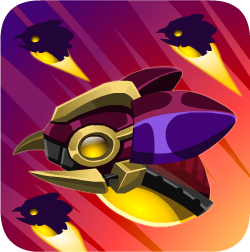 VelocityAE is up on the iTunes App Store and Google Play store right now. Please show Rolith and his hard work some love by giving VelocityAE 5-stars and help us spread the word, then tweet screenshots of your runs to Rolith, Artix, Korin, or Cysero! If you’re a long-time player of Artix games, then you probably recognize this fellow.That’s Rolith, our resident code monkey. 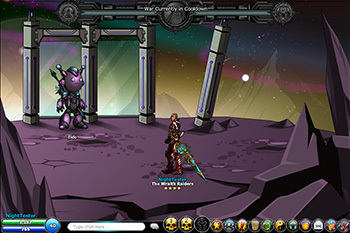 He’s been Artix’s longest coder, cracking away at DragonFable in 2006, and has dabbled in just about every Artix game ever since. “Have you told Artix about your game, Rolith?” Cysero asked. “Um, No...” whispered Rolith, “Don’t tell Artix about Velocity yet. Rolith smirked. 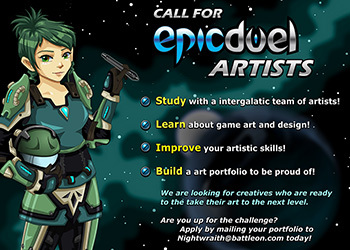 Artix went o_O, leaned in and asked, “Did you, uh… already submit it?” Rolith was taken aback. “Should I have waited?” “No, no…. 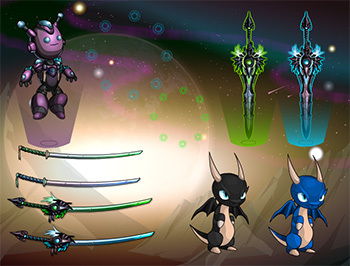 this is great!” Artix reaffirmed. “At least you did not use your spare time to making another game about Ponies! Let it go live secretly, we can make fixes and then tell the whole world about this!" Rotting Cutlass P/E was tagged as seasonal but still in shop. Added scheduler to remove them. 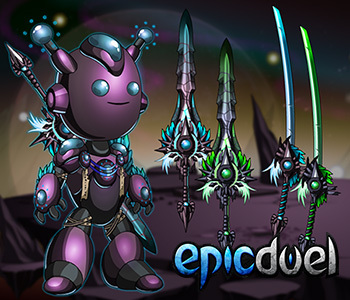 This Friday, get ready for a heavy dose of EpicDuel lore! Guest Writers Silver Sky Magician, One Winged Angel, and Ranloth have crafted several harrowing mission chains focusing on some of EpicDuel's more obscure characters: Mort, Anya, and Zedmyr! In addition to new missions offering killer rewards, you'll be able to unlock 4 new achievements for defeating Mort, Zedmyr, Anya, and Mirv. If you're really persistent, you'll be able to claim Zedmyr and Mort's rifles for your very own! Now, I'd like to leave you with a lovely bit of prose created by Guest Writer Silver Sky Magician. Enjoy! It was all a lie. Delta V was never a paradise, not before the Banishment, not before the Uprising, not even before Baelius. Just ask a Marauder – it was always hell here. A little more contained, perhaps, a little more out-of-sight, but this fear, this despair, this cruelty – it was here from the very beginning. Before Baelius, there were the natives. The ones I lived with were the Sae’ilians. Children of the sky, in their language, for their rich blue skin. Of course, back then the sky was actually blue...but I digress. The Sae’ilians were beautiful people, their voices music, their gaits a dance. Their paintings and sculptures so stirring and exquisite that thousands flocked to Delta V just to see them. Flowers even bloomed where they walked – no, really. They planted seeds everywhere. If you were an immigrant back then you’d have thought you’d died and went to heaven. Then there was us. Those who weren’t fit to enter heaven. The dirt under the carpet – the disabled, the discoloured, the disfigured. Abandoned from birth into the underbelly of society. Well, not entirely. They couldn’t let us run amok, could they? Who knows what sorts of heinous crimes we could commit! Or worse, we might show our mugs in public. So we were forced to do the tasks too inelegant for normal people. Throwing out the trash. Maintaining the sewers. Cleaning up after the dogs. And in exchange we got the leftovers from their tables. Some treated us as mysterious invisible forces who could compel them to move far away. Some – typically the children who hadn’t learnt such sophistication – preferred abuse. Jeering at us, their voices music. Kicking our ribs, their gaits a dance. We couldn’t strike back, of course. Everyone suddenly saw us then. Quite a few of us endured it with shame. When beauty is a virtue, ugliness becomes a vice. Who could protest against the actions of angels? The rest of us, though, were only too happy to follow the flip side of the Sae’ilians’ logic. If we were born irredeemable criminals, why, should we not strive to achieve our manifest destiny? I came onto their radar when I killed my parents and my lovely little sister one fine cloudless day. Or at least, I think I did. Couldn’t really be sure who my folks were. Anyway, they hunted me down pretty quickly, but I escaped into the sewers. They didn’t even try to follow me down. Too scared of the filth. So they sent the slaves after me, half of whom punched me in the arm with stupid grins. The rest pretended that they couldn’t spot a hunchbacked shadow the size of three men. I went on the run after that, into the underworld where the real baddies thrived. Bashed my way up the ranks and made my name as a premium black market dealer. Added some melee weaponry and guns and sweet bazookas to my arsenal. But nothing could beat a brawl. Then Baelius started tightening his fist around the planet. I was classified as a Marauder, to differentiate my kind from the hundreds of other categories of outlaws, like Rebel, or Bounty Hunter, or Artist. Bah, bureaucracy. Soon the Uprising was in full swing. Legionnaires torturing us, mowing us down. Exiles avoiding us like nuclear waste. Same old, same old, though it was a good deal more annoying this time. Never could sleep for long before a bullet buzzed past my ear. Soldiers smashed themselves into my fists like mosquitoes. All the fault of that Legion General, Kojimura or something. But that cursed lizard almost made up for all that with the greatest spectacle I’ve ever seen. Incinerated the Flatlands, ha ha ha, burnt up all the villages! Exposed it for what it really was – a hollow wasteland. I’d give him a friendly smack on the neck if Slayer hadn’t already done it. Most of the people escaped somehow. A flood of refugees, unused to anything but extravagance. The black market swelled and business boomed. Shoes that’ll last more than a week? Ten thousand credits! A gun to protect your family? Fifteen thousand! Bullets sold separately, heh heh heh. Diapers? You’re out of your mind, a hundred thousand if I ever come across one! Crime was no longer our exclusive domain – it surged out into the open like a plague. Neighbours tearing the clothes off each other’s backs. Marauders competing through stabbing sprees. A Sae’ilian eating her pretty child, mouth stained an ugly purple. I was an emperor and my kingdom was a junkyard. “A new world.” My smile faded and I fingered my gun. I gave him all of it there and then. It takes a madman to change a mad world. Things improved beyond our wildest dreams. Within months the Bazaar was set up and the refugees had basic amenities. We even got electricity and water running – Ulysses, the masked man, could work magic with machines. The Marauders tried to wreak havoc, of course, but there was no one in the Barrens who could get past me. And that man, the new director of the Bazaar, made it all possible. People began calling him a god. He didn’t like that at all, but the name stuck. Thousands flocked to him for a miracle. The pressure got to him, and he started hiding away in Kojimura’s fallen airship. Obsessed with bodyguards, even though he had me. Scrambled to accommodate the demands, the new refugees. He failed, of course, and commanded me to stand guard, keep them out of the Bazaar. Left on the edge of heaven by the man who saw I had a soul. I started killing more refugees than Marauders. Sometimes hundreds at once, when they tried a riot. But I stood firm and refused to stop believing. Not even when the saved stopped smiling. Not even when Ulysses left. Not until he told me to sell weapons to the Legion who expelled his family, so that they wouldn’t interfere with the trade. Business boomed. The refugees kept coming. Blood roiled like clouds in a thunderstorm. Here at Artix Entertainment, it can sometimes seem like all the game teams are completely separated, almost adversarial at times. However, as we move into the next generation of AE games, we want to make it clear that we're all in this together! So far, many other programmers, artists, and writers have pitched in and helped us focus our efforts on making BioBeasts the best game it can possibly be. 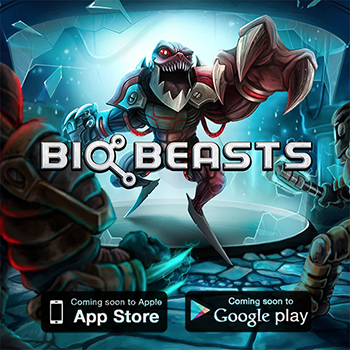 Our latest collaboration is a cross-promotional event to help us spread awareness of BioBeasts! 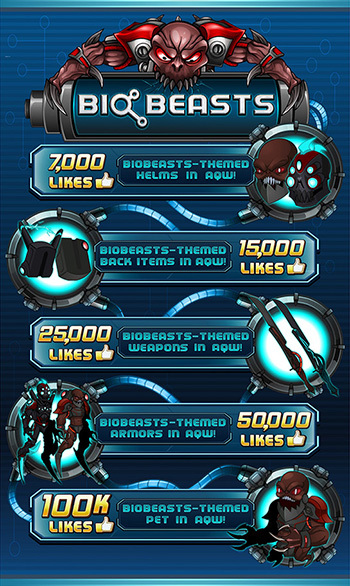 The best way to follow development is through social media and our development blog, and AdventureQuest Worlds is offering a crate of free gear waiting to be unlocked by liking BioBeasts on Facebook! Follow the development process step-by-step and be rewarded with free loot for doing so? Win! Win! Describing the details below is the one-and-only Beleen! 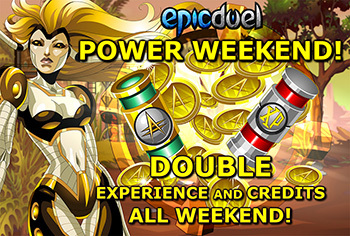 It's time for another EpicDuel Power Weekend! Get double experience and credits all weekend long! This is a great way to build Legendary ranks quickly and dominate your foes. That buff will help prepare you all for another BIG update next week featuring backstory of some of Delta V's most mysterious figures: Mort, Zedmyr, and Anya! Anya, Mort, and Zedmyr, OH MY! 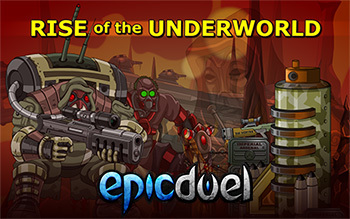 Coming next week, a novella's worth of story is dropping in on EpicDuel as Ranloth, SSM, and OWA put their talents toward revealing the backstories of some of EpicDuel’s most popular and mysterious NPCs! Why is Zedmyr so grumpy? Why does he look just like Mort? Are they related? You'll also have an opportunity to test them in battle! Careful! Mort and Zed are tougher than they look! All those credits from Power Weekend will come in handy for Bido's upcoming showcase shop! You'll have a lot of loot to choose from including a host of primaries as well as sidearms and auxiliary weapons. This event will also reveal the origin of Bido and how he came to find himself adrift in the Afterlife. In a previous post we discussed enemy design in BioBeasts, but there's still much more ground to cover. At that point, our enemy behaviors were relatively simple; enemies would run towards you and attack. The difficulty variables were limited to the enemy health, speed, and spawn rates. Now enemies are finally getting interesting. Learn more about the strange and sinister foes you'll encounter in the latest BioBeasts Design Notes post!